We rolled into the town of Bayfield on a warm Independence Day evening. At about 6:00pm, many of the shops where open and shop keepers where willing to stay open as long as the customers kept coming in. Our main reason to be in town was to see the fireworks, but since Memorial park near the public marina wasn’t filling up very fast, we decided to plant our chairs in a good spot and take a stroll downtown as we waited for the sun to set. Bayfield is a little community of about 480 people, but the summer population swells with vacationers and summer cottage renters. This mix of small town folk and upscale tourists makes for an interesting mix of shops. Although the community is still very homey, not like raucous commercialism of the Wisconsin Dells, and or the high end sensibilities of Door County. In our journies downtown, we end pick up a nice bottle of wine and some chocolate cookies, head back to our chairs and watch the boats enter the leave the docks as the sun sets. Soon the crowd at the park swells while the sky gets darker. It’s almost 10pm and no fireworks yet. But we see a barge planting itself offshore and a Coast Guard cutter working its way around the barge, trying to keep boats from venturing too close. The first fireworks we see are off in the distance, the far distance. Craning your neck you can see the fireworks display in Ashland, down the bay 22 miles to the south. 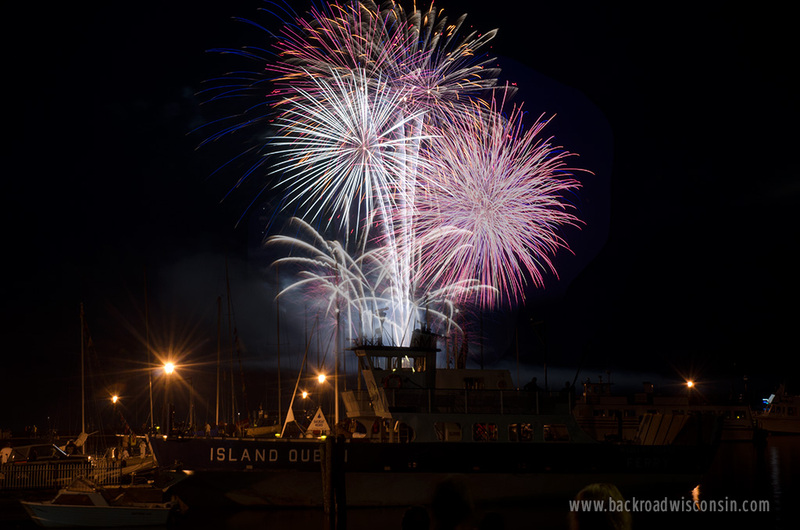 Then across the bay on Madeline Island, the town of La Pointe lights up the sky with their display. This looks like things may be competitive. 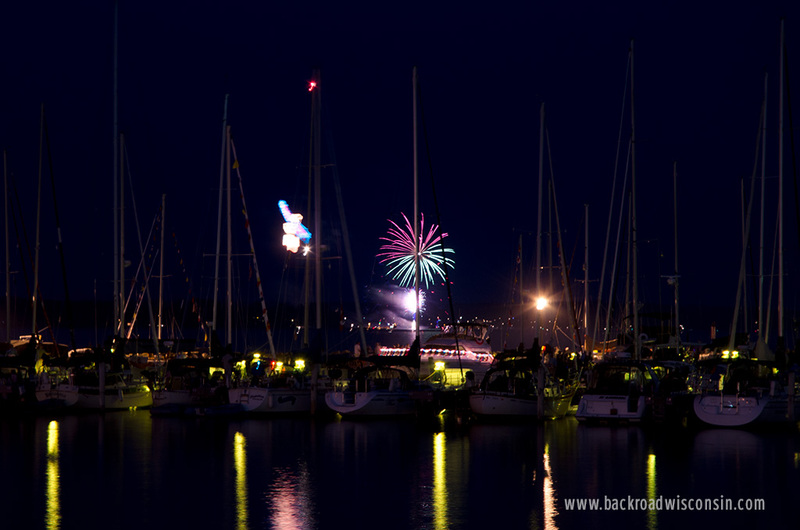 Five minutes into the La Pointe show, Bayfield sets off their fireworks. Our vantage point has the rockets and mortars going off in the sky over the Island Queen ferry moored to one the town’s piers. The sweet smell of reefer permeates the air. Yep, the crowd is enjoying this show all right. Bayfield puts on a beautiful 20+ minute show, although a technical glitch extends the grand finale. Instead of one large boom, several smaller booms are stretched out over a two or three minute pause. The crowd doesn’t know what to do. Everyone starts packing and all of a sudden more fireworks appear. We just sit and wait, taking the whole show in. 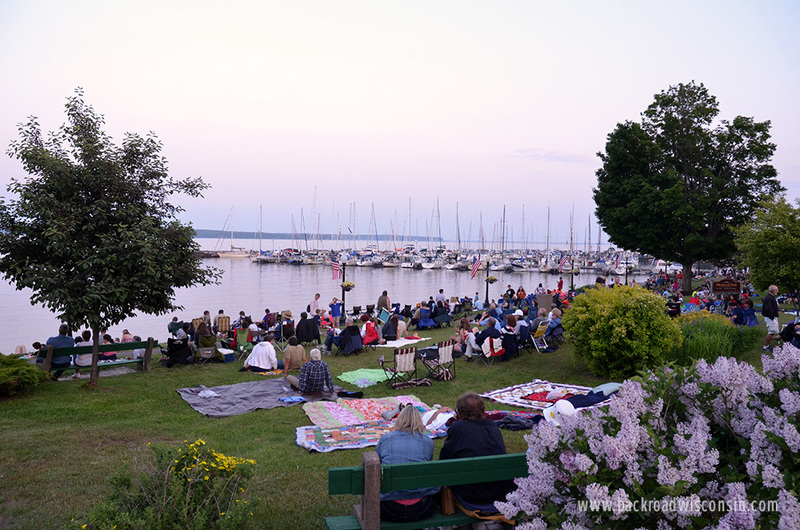 If you go, the Bayfield town fireworks happen on the 4th of July just after dusk. 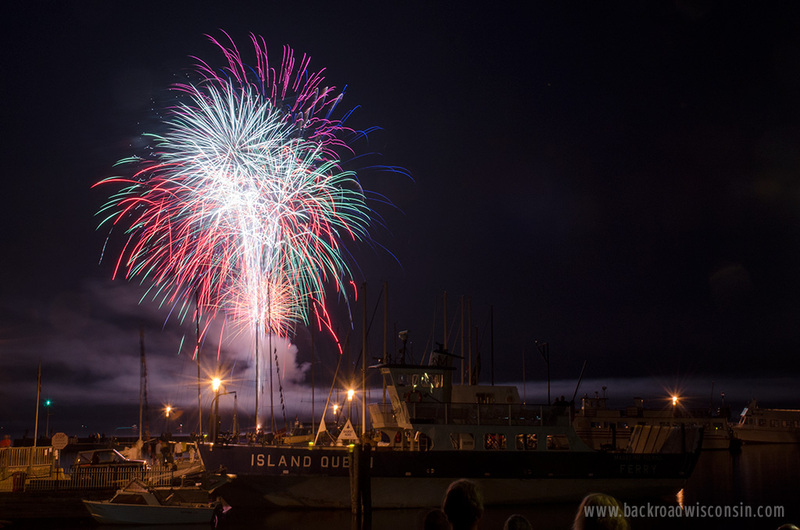 The fireworks are launched from a barge in the bay, so pick a spot in Memorial Park down by the docks. The north end of the park seems to be the best location, although there really isn’t a bad spot in the park. Put down your chairs or blanket to reserve your spot and feel free to wander the town while waiting for it to get dark.